Leaders of the labor movement in our city have been both welcoming and patient with me in this first year as Archbishop of Chicago. Until now, I have been unable to respond to the many invitations offered over these past months to visit you. I am grateful for these gestures of welcome and your understanding. Coming here today to the Chicago Federation of Labor seemed the most appropriate way to respond to all of you. Thank you, President Jorge Ramirez, for creating this opportunity and gathering us together. Thanks as well to President Coyne and the Local 130 Chicago Journeymen Plumbers for opening this hall to us this morning. One of my priorities since arriving in Chicago is to build bridges and partnerships. Today, I reach out to leaders of the labor movement and all who are here today. I see this opportunity as the first of many to build on the proud tradition of collaboration and common commitment between Labor and the Church. You know better than I how that collaboration has been fostered, especially by Chicago priests. First and most notably, there was the late Msgr. George Higgins, a giant in both the Church and the labor movement, whom I knew well from our days together in Washington, DC. We miss his voice. Then there is Fr. Clete Kiley who is very much alive and we are blessed to hear his voice in these important times. I come today to offer my friendship and support as Chicago’s new Archbishop and to renew an essential and longstanding relationship between the Catholic Church and the labor movement. Our ties are built not on personalities, though we have been blessed with great leaders, but on enduring principles: the dignity of each and every human being made in the image and likeness of God, the dignity of work and the rights of workers. The principles of solidarity, which give priority to the poor and vulnerable, of community and the common good. I seek an ongoing relationship that honors the past and builds a strong and better future for all the people we both serve here in different ways in Chicago and the broader metropolitan area. I believe a strong, respectful, effective and open relationship between the Church and the labor movement is good for Labor, good for the Church and good for Chicago. He said this when he was in Brazil in July 2013, but I hope and expect he will bring this same powerful message to our country next week. My central message today is that I want the Church to become an even more committed partner in this civic solidarity, joining with business, government, and Labor in promoting the common good, especially in protecting the lives and dignity of those who are too often left behind in our city, nation and world. Many of you in this hall have heard of the ground breaking encyclical letter of Pope Leo XIII, called Rerum Novarum, published in1891. Pope Leo expressly urged Catholic bishops and priests to “go to the worker.” I ask that you see my presence here today as a response to that mandate of nearly a century and a quarter ago. I have come today to tell Chicago’s workers, the Catholic Church is with you; Pope Francis is with you; I am with you. And I do so recognizing that my message to business leaders and elected officials is the same as we work together to build a better Chicago and promote the common good. What Can Union Members Expect from the Catholic Church Here in the Archdiocese of Chicago? There are at least four things the Catholic Church in the Archdiocese of Chicago offers organized labor, given the historically deep connection and history between the labor movement in Chicago and the Catholic Church in Chicago. The Church can offer its vision, its principles and a moral framework that can lift up the dignity of work and affirm the human dignity of all and rights of every worker, man or woman. The Church can raise its voice on issues that affect workers and their rights and their families. The Church as an employer can try to practice what it preaches about the dignity and rights of workers in terms of wages and working conditions. The Church can be a voice, an ally and a partner in the search for greater justice and the pursuit of the common good. What brings the labor movement and the Catholic Church together is not politics, economic theories, or ideology, but rather a set of beliefs and commitments about human life and dignity, about work and the rights of workers, about solidarity and subsidiarity, about justice and the common good. We have to remind each other and ourselves that these principles are not just slogans or footnotes, but a way of thinking, acting and measuring our efforts. For centuries, but especially over the last 125 years, the Catholic Church has offered a strong and principled vision on the dignity of work and justice for workers. Pope Leo XIII called for standards of justice in the work place including the right to a living wage, the right to safe work places, the right to health care, and to the need to provide for retirement. Work and unions are important not simply for what a worker “gets,” but how they enable a worker to provide for a family and participate in the workplace and society. Unions are important not simply for helping workers get more, but helping workers be more, to have a voice, a place to make a contribution to the good of the whole enterprise, to fellow workers and the whole of society. In The Joy of the Gospel Pope Francis writes about the connection between a just wage and participating in society calling at the same time for “education, access to health care, and above all employment, for it is through free, creative, participatory and mutually supportive labor that human beings express and enhance the dignity of their lives.” And then he added, “A just wage, enables them to have adequate access to all other goods which are destined for our common use.” (Evangelii gaudium, 192). Across the twentieth century and into the twenty-first, ten Popes have affirmed and expanded this very vision. The Church believes work is important not just for the wages it provides, though fair wages are a basic right, but for its contribution to human dignity. A society that fails to see the link between work and the promotion of human dignity risks its future as the Holy Father warned in his 2014 address to Italian youth. This is what he said: “We cannot resign ourselves to losing a generation of young people who do not have the dignity of work! … A generation without work is a future defeat for the country and for humanity. … We must fight against this, and help each other to find a solution, through help and solidarity.”(Address to youth of the diocese of Abruzzo and Molise, Shrine of Our Lady of Sorrows, Castelpetroso, Italy, July 5, 2014). And this past July, Pope Francis spoke in Bolivia to an international gathering of grassroots activists at the World Meeting of Popular Movements in Santa Cruz. His concluding words are very powerful. “The future of humanity does not lie solely in the hands of great leaders, the great powers and the elites. It is fundamentally in the hands of people and their ability to organize. It is in their hands, which can guide with humility and conviction this process of change.” (Speech to Popular Movements in Bolivia, 4). For me these words mean that leaders both in Labor and in the Church need to stay close to the rank and file members if the transformational change the Pope is calling for is to take place. These words are both stirring and challenging for all of us. They also help build our anticipation of the Pope’s upcoming visit to the United States. Already, many in the labor movement have offered a warm welcome to the Pope. I am confident his message will strengthen our ties and challenge us to renew our commitment to our common values. The Church does not simply provide a vision for a just economy and for the rights and dignity of workers. The Church also is called to speak out, to offer a challenging voice, sometimes a prophetic voice, to advance these principles in economic and political life. In defending human life and dignity, in promoting solidarity and the common good, we will defend workers and their rights, the roles and responsibilities of unions. We will seek to be clear and consistent in defending human life and dignity and those who are excluded or treated unjustly and we hope the labor movement will do the same no matter which party or powerful interest it may offend. We share so much in common when it comes to standing with those left behind or those who are left out. We have already worked together in promoting comprehensive immigration reform. I commend the Chicago Federation of Labor and other people of good will in this regard, including business leaders who have advocated for a just reform of a terribly broken system which hurts immigrants, workers, our city and our nation. Mayor Emanuel also deserves credit for helping to keep Chicago a welcoming place for immigrants and refugees seeking a better life. The horrifying picture of the little Aylan Kurdi, the small Syrian “boy on the beach,” should call us to action in welcoming all those fleeing oppression, violence and despair. We need to stand together…religion, Labor, business, government… in rejecting rhetoric or tactics which demonize and demean immigrants or blame them for problems they did not cause. This kind of angry posturing hurts our nation and diminishes all of us. It also fails to address the real problems which require wise policy, just principles and bi-partisan action. I will also add my voice when it is prudent and helpful in egregious examples of injustice. The Church can’t weigh in on every issue, on every dispute…it lacks the capacity or the competence. However, when the Church sees fundamental values being threatened or undermined, the Church will speak up—to offer basic moral principles, to defend the weak and vulnerable and to promote the common good. For example in view of present day attempts to enact so-called right-to-work laws the Church is duty bound to challenge such efforts by raising questions based on longstanding principles. We have to ask, “Do these measures undermine the capacity of unions to organize, to represent workers and to negotiate contracts? Do such laws protect the weak and vulnerable? Do they promote the dignity of work and the rights of workers? Do they promote a more just society and a more fair economy? Do they advance the common good?” Lawmakers and others may see it differently, but history has shown that a society with a healthy, effective and responsible labor movement is a better place than one where other powerful economic interests have their way and the voices and rights of workers are diminished. Let me also say that the Church’s search for the common good takes other forms as well. Friends can disagree and can see things in different ways. Admittedly, these differences can create tensions, but they should not break relationships. In times of tension, I ask you to keep in mind that the Church’s commitment to solidarity with workers is rooted in our commitment to solidarity with all. The Church stands in solidarity with the undocumented. We stand in solidarity with the poor and homeless. We stand in solidarity with unborn children and their mothers. We stand in solidarity with the unemployed. We stand in solidarity with families and their children and their right to a good education. We stand in solidarity with the elderly and the sick. Some of you will not share our commitments on one or more of these priorities. I ask that you respect that these commitments flow from the same, core belief in human life, human dignity and solidarity as our support for workers and their unions. My hope is that people will see that the Church is calling for a consistent ethic of solidarity that aims at making sure no one, from the first moment of life to natural death, from the wealthiest community to our poorest neighborhoods, is excluded from the table of life. We resist what Pope Francis calls the “throwaway culture,” that treats people as things and is tempted to discard the weak and the vulnerable, those without money or power or voice. Elements within the labor movement, as in every institution – and the Church is certainly no exception – can fall short of its ideals and mission. All institutions can become insular, lack diversity, become too self-interested and self-referential, or can be used for partisan or ideological purposes that have little to do with their core missions. We know too well from our own experience within the Church that institutions and their leaders can be unaccountable, distant, and unresponsive and can violate trust. All of your members and the nation deserve no less than the best from your leaders, for they hold in trust the legacy of the great contributions made by the broader labor movement. So many have sacrificed for justice and fairness, for a 40 hour week, for minimum wages, for Medicare, Medicaid and Social Security, for family leave, for civil rights, for universal health care and the fight to organize itself. Accountability at all levels, especially the highest levels, is vital to keeping alive and honoring this rich legacy and the vision that the whole is more than the sum of its parts. As an expression of solidarity, I would to ask your understanding on a matter that is frequently misunderstood. I refer to the Church’s appeals for respect for religious freedom as we carry out our work to serve those in need in our city and our nation. When we insist that government cannot define what is and is not a religious ministry, when we ask that government not require us to violate our moral principles, it is not just about a special pleading, but goes to the heart of our exercise of solidarity. For us, feeding the hungry, sheltering the homeless, protecting the unborn, caring for the sick and welcoming immigrants are religious duties, not just service to society. Our consistent ethic of solidarity, our teaching on human life and dignity requires the church to speak up on behalf of all the vulnerable, just as it requires us to raise our voice for the dignity and the rights of workers and in the pursuit of economic justice. These are not simple matters and they require accommodation and mutual respect. Ad I have to admit not every claim of religious freedom is valid and the law has to protect the basic rights of all. Like all of you, the Church believes that rights do not only belong to individuals and corporations, but also to groups such as unions and Churches. We do not insist that everyone believe what we believe, but we do maintain that our American traditions have allowed us in the past and should allow us in the future to preserve our religious identity and free exercise of religion as we carry out our ministry to the “least of these” and make our contributions to the common good. Let me offer another example. One of the things I am most impressed with since I have come to Chicago is the outstanding work of our Catholic schools in some of the poorest and toughest parts of our city. I am also impressed by the service they give to the children of workers and the children of the unemployed. I admire the good work of all those, in public and non-public education alike, who offer their skills, knowledge and dedication in our inner city schools. But I am haunted and challenged by the powerful economic forces, social pressures and demographic trends that put inner city Catholic education at risk. I know that many of you share my view that the diminishment of inner city Catholic education would be a loss for lots of kids, for their families, their neighborhoods and the larger Chicago family. I am encouraged that many labor leaders are supporting the Illinois Kids Campaign’s education tax credit initiative. Many in the labor movement found in Catholic schools a way forward to a better future for their families and many of you send your children to our schools today. I don’t want or expect anyone to turn away from the struggles to support and improve public education. Most kids, most Catholic kids, are in our public schools just as many kids in Catholic schools are not Catholic. But the way I look at it, we should come to an agreement that whether they are in public or private or parochial schools, they’re all our kids and deserve the best education this country has to offer. So, what I am offering is a hand of friendship, inviting all to work together to improve the education of all our kids and as a part of that, to work to keep alive the remarkable service of inner city Catholic schools that are beacons of hope in some of the poorest neighborhoods of Chicago. You can count on me to work with others to support public education, its funding and improvement. But, I also invite and need your help in avoiding the loss of valuable Catholic schools that provide help, hope and are an essential contribution to a better Chicago. In the end, as partners in building the common good, we need to commit ourselves to learning from each other, staying together through it all, because the rights and dignity of workers and all God’s children deserve our collaboration and mutual good will and respect. After all they are all our children and again, we owe it to each other to have a consistent ethic of solidarity. As the Catholic Archbishop of Chicago and one of the largest employers in Cook and Lake Counties, I have come to depend on the advice and counsel of our very vibrant business community. They have been generous in responding to my request for guidance on how best to manage such a complex organization. But I also need and am grateful for the advice of Labor. You know first-hand some of the best practices for employment and have experience and wisdom that needs to be tapped. You created the week-end. You advanced the concept of universal health care. You stayed vigilant about job safety. You advocated family leave, and so much more. Your members are everywhere in the Archdiocese. Many of your members are also part of our family of faith. But, whether we are of the same faith or a different one, or none, we are all God’s children. We serve together and we can learn from each other. The Archdiocese of Chicago employs 15,000 full and part-time employees in its agencies, seminaries, schools and parishes. We strive to be a just employer. I have asked our Archdiocesan staff to review all of our human resource policies to ensure we are practicing what we preach about the dignity of work and the rights of workers. We will work earnestly to address any gaps. After all, like everyone we also need to be accountable. Because the Archdiocese is an employer, some employees and some unions may want to organize in our workplaces. Some Archdiocesan employees are already organized and we work with their union to advance our mission and our mutual obligations to workers. Others are not. And that is because some “jobs” in the Church are really ministerial positions, and must answer to a higher law than those passed by legislatures, we may have differences in this area. But if we stay firm in our commitment to principled dialogue, we can resolve differences and move forward together. That is my hope. I ask President Ramirez and the Chicago Federation of Labor to collaborate with us in creating a workable mechanism for dialogue and to resolve conflict whenever it should arise. For more than 30 years the Archdiocese has had a Project Labor Agreement with the Building Trades. Cardinal Bernardin initiated this agreement and Cardinal George continued it. Today, I affirm it as well. And, being new here, I expect the specifics of this agreement are probably due for a review and updating, and so I ask President Ramirez to meet with my delegate, Fr. Kiley, to create a vehicle to conduct this review. This has been a good policy. It is the right thing to do. And, besides, it will keep that Giant Rat off my porch. A long-standing policy of the U.S. Catholic Bishops Conference is to hold its meetings and events in union hotels, or in the absence of such, in hotels free of labor disputes. UNITE HERE has developed a program you may be aware of called the Fair Hotel program, something like a fair trade program. The Archdiocese and its agencies will also adopt this approach when scheduling our events. We will work together to find the words and means to honor this commitment. My final point is that I hope that you and your members will see in the Catholic Church a consistent ally for economic justice and a partner in promoting the common good. First, I will personally support workers’ efforts to secure their rights and adequate conditions to accomplish their work. In a talk last June, Cardinal Donald Wuerl of Washington observed that growing up in southwest Pennsylvania he learned early on that “one visible way that solidarity was manifested, both within the movement and in the larger society, was respect for the picket line. He also talked about the new “picket lines” that should not be crossed, like demonizing immigrants, racial profiling and wage theft, to name just three. In solidarity with you, I want you to know that the Archdiocese of Chicago will honor your picket lines. Secondly, I will continue to encourage priests of this Archdiocese to be involved in the labor movement. They will continue the legacy of great priests such as Msgr. John Hayes, Msgr. George Higgins, and Msgr. Jack Egan and Fr. Clete Kiley. I welcome and support the participation of priests in the labor movement, but we need to be clear. The presence of the Church in the labor movement is not primarily through the participation of clergy, but through the leadership of Catholic lay men and women in their unions and in the larger labor movement. The Catholics in this room and those who follow you are the Church in the labor movement. You put your faith into action. You are Catholic social teaching at work. Thirdly, many union members are members of our parishes. Thank you for the leadership, service and investment of so many union members in their local communities of faith. Working with our Peace and Justice Office and our pastors, I would urge that we look for ways to encourage and promote conversations about work and worker rights at the parish level. I particularly hope we might focus on the experiences of immigrant workers who are very vulnerable. Labor Day offers opportunities for celebration, education and advocacy on work and workers. Fourthly, many years ago we had Labor Schools here in the Archdiocese. Today, let’s explore how Catholic Labor Leaders, Catholic Business Leaders, and others can find new ways to share the message and educate the next generation of Catholics and workers, The Church is deeply concerned about how consumerism, materialism, excessive individualism, and extreme libertarianism and economics shape people’s lives today. The Church is also a voice on behalf of workers facing dire circumstances in other countries. This, too, is part of the Catholic vision we share with the labor movement. We should be willing to do more in joining our hands in solidarity to support our brothers and sisters in other lands. The Catholic vision and its moral framework offer a different way of thinking and a different way of acting in economic life. We need to share this vision more broadly and deeply, ever committed to a consistent ethic of solidarity. I’ve laid out a lot here this morning. As I said, I want this to be the beginning of a conversation, not the end. I’ve tried to identify areas of ongoing collaboration, future challenges and opportunities for new work together. I ask President Ramirez to join with me to create a working group of representatives of the Chicago Federation of Labor and the Archdiocese to review the proposals I have offered this morning and others and to recommend ways we can work together, especially in the challenging situations we all face. The Catholic Church in Chicago and the workers of Chicago helped build the national labor movement. Great leaders in our Church and city years ago took up this mission with courage and commitment. Now it is our turn. I come today to offer my thanks and commitment, my faith and my hope that we can build on this proud legacy by working the Chicago way – with Labor, government and business – to promote the dignity of work, protect the rights of workers, act with greater solidarity and pursue the common good. We have more to do together. We have a lot more to do together – in solidarity. On July 1, 2015, the minimum wage in Chicago increased from the state rate of $8.25/hr to $10/hr. Because wage theft is already rampant in Cook County (over $1 million stolen from low-wage workers every day), Arise is launching an unprecedented outreach campaign to educate workers across the city about the new $10 rate. “Max the Minimum” will educate our base of hundreds of worker leaders, thousands of workers in our member congregations, and hundreds of thousands of workers through community and media outreach. Can you help us reach all 410,000 minimum wage workers in Chicago to let them know about the new $10 wage? It’s a big goal, but with your support, we can do it! Can you give $10 a month to sustain our ongoing outreach campaign? Or consider a one-time gift of $410 in honor of the 410,000 minimum wage workers in Chicago. If your organization or congregation is interested in hosting a Worker Rights Workshop to discuss the new minim wage and other rights on the job, contact Member Organizer, Manuel Diaz. CAN-TV Workers Rally for A Union! WHY: A majority of CAN TV workers have signed union cards to be represented by the National Association of Broadcast Employees and Technicians – Communications Workers of America (NABET – CWA), citing low wages and lack of voice on the job. Like workers at ABC, NBC, UNIVISION, TELEMUNDO and Fox, workers at CAN TV decided to organize under NABET-CWA Local 41, Chicago’s Broadcast Union. On Tuesday, February 10th, the Cook County Board of Commissioners voted unanimously in favor of the Cook County Anti-Wage Theft Ordinance! The Ordinance prohibits businesses that engage in wage theft from obtaining county contracts, business licenses and property tax incentives for a period of five years. Cook County becomes the largest county in the United States with such provisions. BBC Interview on wage theft in Chicago and the U.S. with Arise Chicago’s Adam Kader. Anti-Wage Theft Ordinance Passes City Council Unanimously! As a result of the months of collaboration between Arise Chicago and Alderman Pawar (47th ward), on Thursday, January 17th, the City of Chicago passed an ordinance stating that, should a business owner be found guilty of wage theft, the owner’s business license could be revoked. This makes Chicago the largest city in the country with anti-wage theft legislation. The ordinance, endorsed by the National Employment Law Project as one of the strongest actions a municipality can take to combat wage theft, will impact hundreds of thousands low-wage workers and their families in Chicago. The ordinance gives desperately-needed tools to the city of Chicago to ensure employers obey the law. 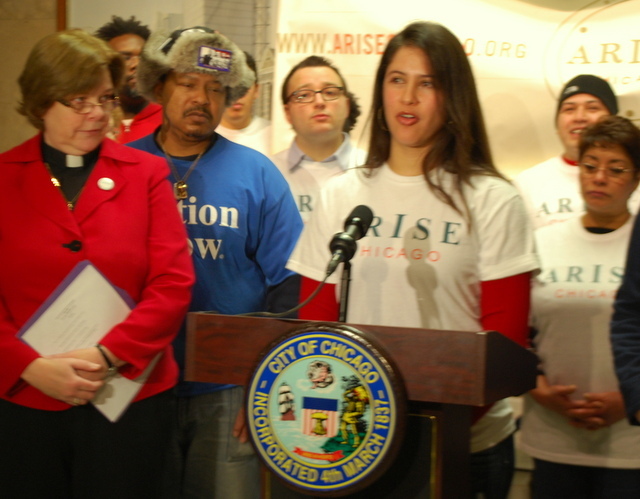 Follow the latest on the new anti-wage theft ordinance by joining Arise Chicago on Facebook and Twitter. Arise Chicago Board members Rocio Caravantes and Prof. Bob Bruno were featured in Sunday’s Chicago Tribune cover stories about the urgent need to raise the minimum wage. See a video of Rocio’s interview on her commute to one of three part-time jobs from the Chicago Tribune. Chicago Tribune: What would a $15 minimum wage mean to the economy? What would a $15 minimum wage mean to the economy? A national push to raise employee wages at restaurants, supermarkets and elsewhere to as high as $15 per hour pits labor organizers against business owners in an emotional debate about economics and the cost of living. Not directly included in the discussion is an important constituency: the customers. If they support the idea of an increased minimum wage, they will likely see higher prices for hamburgers, clothes and other goods. Economists and others who study consumer behavior say that shoppers may react sympathetically to the call for higher pay for workers in the service industry who struggle to make ends meet, but in the end they will take care of their own needs. “I would pay a couple of dollars more for products, but the question then is, do I get a raise too? If my salary goes up, I will be willing to pay even more for my products,” R.B. Barrett, 45, said outside a Whole Foods store in the Lakeview neighborhood where about 100 people chanted and passed out fliers Wednesday outlining their demands: $15-per-hour wages and better working conditions. Business groups say significant wage increases would require many of their members to lay off workers and pass on costs to consumers. Some argue that doubling wages, combined with the increased employer costs for the national Affordable Care Act, could put their members out of business. On Wednesday and Thursday, protests were held in Chicago as part of a nationwide movement of organized events that included demonstrations in New York, Detroit and Milwaukee. Many who protested here earn an hourly wage around the state’s minimum of $8.25, which would translate into an annual salary of about $17,000. A raise to $15 per hour would mean a salary of $31,200. In Chicago, the demonstrations were run by the Workers Organizing Committee of Chicago, a recently formed union backed by local labor groups, including Arise Chicago, the Chicago Teachers Union and local affiliates of the Service Employees International Union. The workers’ push for higher wages comes as the nation has yet to create all the jobs lost during the recession. There are nearly 12 million people unemployed still looking for a job. Economists say many thousands more have given up hope. The high unemployment seen in the aftermath of the Great Recession is hurting wages across the board, said Heidi Shierholz, a labor economist with the Economic Policy Institute, a labor-oriented think tank based in Washington. “There is a very tight link between high unemployment and low-wage growth. It’s just as simple as if your employer knows you don’t have any outside options. They don’t have to pay you wage increases to keep you,” Shierholz said. Those earning the lowest wages, she added, have been hurt the most. Before the 1970s, wages for most workers grew at about the same rate as productivity, but globalization, politics and economic policy broke that relationship, Shierholz said. The minimum wage also followed that trend, and if it had continued, she added, the federal minimum wage today would be closer to $18 per hour instead of $7.25. That doesn’t mean that the economy could handle doubling the minimum wage overnight, but it could start increasing slowly, she said. “This campaign underscores that the wages for the whole bottom swath of the wage distribution are just too low,” Shierholz said. Lorraine Chavez, a spokeswoman for the Workers Organizing Committee union, said the goal is not to double wages overnight. Workers also want better working conditions and full-time employment. And the union is prepared to continue to strike and plan other events until they reach all those goals. “Workers have no choice,” Chavez said, adding that at $8.25 per hour, many workers qualify for food stamps and can’t afford to pay rent. While consumers say they empathize with the struggle, for the many whose wages have stagnated and don’t feel confident about the future, price trumps making a moral or ethical purchase. “There is a big competition inside every consumer’s mind between really wanting to do something that would help other people and really wanting to save money,” said Kit Yarrow, a professor at Golden Gate University in San Francisco who specializes in consumer psychology. Yarrow said consumers would likely choose to support a noble cause once or twice, but ultimately personal financial security would win. That’s partly because while consumers feel safe now that the recession is over, they don’t feel OK about the future. “I think the wound was so deep and so great during the recession and so frightening that it made people kind of permanently a little bit more cautious about spending,” Yarrow said. Two articles in yesterday’s Chicago Tribune provided a revealing, if unintended reminder of the injustices lying at the heart of America’s public schools. At New Trier High School in one of the wealthier suburbs of Chicago, all students will have iPads for their course work by the Fall of 2014. The district will pay about 40% of the costs, leaving families to come up with the remaining $350 in purchase or leasing options. School officials justify this by touting the educational benefits and by pointing out that this will allow the school to phase out some of its 1200 laptops. One page away is an article about the school board of the City of Chicago which voted yesterday afternoon to close 50 public elementary schools. In thousands of districts like New Trier, students are getting iPads; in Chicago, New York, Philadelphia, and many other places, students are getting moving orders and teachers are losing jobs. Later on in the same paper The Tribune revealed its editorial bias, offering Mayor Rahm Emmanuel space to justify the closings, while devoting its editorial to a cynical and shameful attack on Chicago teachers. Praising the “heroic” teachers who saved lives in Moore, Oklahoma, The Tribune called on teachers in Chicago to abandon their protest against the massive school closings and become “heroes” by obediently implementing the policies of the Chicago Public School Board and its leader, the Mayor. Excuse me! Chicago Public School teachers are already heroes. They don’t need the condescension of The Tribune. And they don’t need to be unjustly demeaned as less worthy than teachers in Moore. Today they need our gratitude for speaking the truth about the nature and impact of these school closings. Unlike the teachers in Moore, Chicago teachers’ schools are not gone because of some capricious act of nature. They are gone because of decades of very deliberate decisions by public officials, corporate interests and ordinary citizens that have eviscerated the neighborhoods of Chicago, displacing people with the demolition of public housing, gutting communities with foreclosures and the elimination of jobs. The schools are gone because they have been replaced by charter schools, the darlings of politically well-connected school reformers making a profit on tax money while public officials eliminate the inconvenience of teachers unions. The schools are gone because poor African Americans and Hispanics in Chicago are disenfranchised by school governance that is appointed by the mayor with limited accountability to the communities. The schools are gone because public funding in this country remains tied to real estate taxes that benefit wealthy suburbs at the expense of the urban core. The schools are gone because years of school reforms imposed from the latest outside savior have left front line teachers abused and demoralized and their students underachieving. And the schools are gone because white flight that began decades ago has left the cities brown and black and poor. Who makes decisions about public schools today? The President who attended the prestigious Punahou private school in Hawaii and who sends his daughters to the University of Chicago Laboratory School and the Sidwell Friends School in Washington. The Secretary of Education who attended the same Lab School in Chicago. An appointed school board whose membership until recently included billionaire Penny Pritzker, now the appointee to be Secretary of Commerce. She attended the Castilleja School in Palo Alto where 415 girls in grades six to twelve enjoy the attention of 70 full and part time faculty members. In Chicago that school would be deemed “underutilized.” And where do the Mayor’s kids go to school? No threats from school closings for them. They, too, are at the University of Chicago Lab School. These powerful gurus of public school reform didn’t go to public schools and don’t send their children to public schools. They benefited from the growing educational apartheid in this country and they participate in it today. I don’t suggest that these policy makers sat down and said, “Let’s close the schools of poor Black and Hispanic kids in Chicago and make sure that New Trier kids have iPads.” But here are the facts: The schools closed today in Chicago are 88% black, 10 % Hispanic, and 94% low income. And next year the kids in New Trier will all have new iPads. Almost 60 years after Brown v. Board of Education our schools are more and more separate, and more and more unequal. Please don’t tell me that this is a complex issue, that there are no good solutions, that anguished appointed school board members merely did what they had to do given the economic circumstances. I’ve read the reports. I’ve seen the studies. I’ve talked to experts. I can tell you what the real story is about charter school performance. I think I have made a pretty good effort to understand what’s going on. Whatever the specifics, this is about race and poverty and antipathy to unions and political influence and public indifference (how telling that for a time yesterday morning while the Board was deliberating on its closure vote, the lead online story for The Tribune was Bear’s football hero Brian Urlacher’s retirement announcement). I have no doubt that the Chicago school teachers will do as much to protect their children this September navigating new routes to schools across dangerous gang lines as the teachers in Moore did for their students when the tornado came earlier this week. They don’t need editorial writers to tell them to do that. But when their students ask them why their school is gone, just as students in Moore are no doubt asking right now, Chicago teachers won’t have a changing and dangerous climate or the proverbial “act of God” to point to. Their answers will be equally sad, but far more sinister. Originally posted on the John Thomas blog on the Chicago Theological Seminary website.